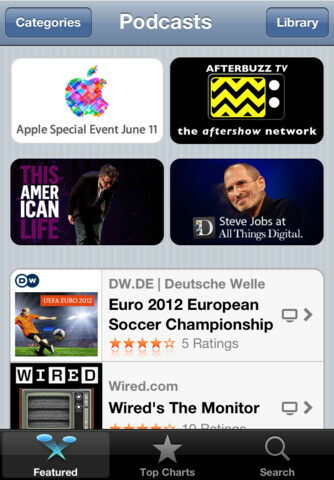 When Peter Kafka at AllThingsD hinted at an upcoming Podcasts app for iOS, we didn't expect to see it until this Fall. Some early tells clued us in that Apple was working on something, and today our best guesses and inside sources held up: Apple has launched their forecasted Podcasts app, and you can download it right now from the App Store. Wearing Apple's iconic purple colors in its icon, Apple podcasts app centralizes the podcast player and podcast section of the iTunes Store in a standalone application. Able to playback audio and video podcasts, Podcasts continues the retro-styled playback controls first seen in the updated Music app on the iPad, and shares the the catalogue views from the updated App Store and iTunes Store on iOS 6. At first glance, Apple's Podcasts podcatcher appears to be a rather basic player, leaving room for power-listeners to continue using their favorite apps like Downcast and Instacast. Podcasts required iOS 5.1 and iTunes 10.6.3 for optionally syncing episodes. 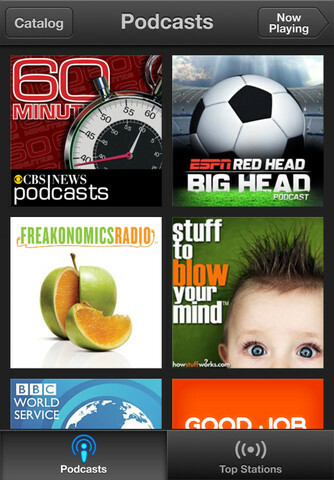 Download Podcasts (a universal app) from the App Store.